I know how frustrating this can be, the truth is that So many other ad networks might be ready to offer their services to you but you as a blogger and a s a person, all you want is google ad showing on your page. look around you and you will noticed that some of your friends are struggling so hard to get approved by AdSense give up blogging along the line, some of them who’s ads network were disabled by google along the line stopped blogging because it seems there is no more joy in what they are doing. 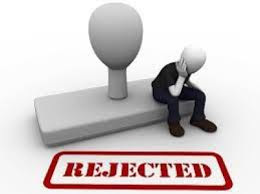 If your in the terrain of those who have been rejected by AdSense over and over again, I know that this could be a diverstating time for you, rejecting any blogger AdSense application seems to be a disappointing time for his career. And at times might lead to those who are new in the in web to quit blogging. any approved AdSense account, you can still make money heavily with your blog. The Big Question Now Is What Should I do When I’m Rejected By AdSense? This is not time to panic: For your freak out or start panic and get worried about your future in blogging just because your rejected will get you nowhere, Google AdSense is an advertiser centric program and network and to meet their advertisers demand, they need more publishers. But at the same time, to maintain their quality of ads and ad network, they accept only quality sites. So with the statement above you will notice that there is something going wrong with you blog and as a result of this, your application is being rejected, so then stay calm and work to make it better. The good thing about every rejected application, is that adsense will point out the mistakes and ask you to fix it and reapply. Don’t Reapply Immediately: Actually, when AdSense reject an application, they will mention reasons like “Insufficient content”, “copyrighted content”, “Url is not owned by you” “Pages hard to navigate” etc. You need to understand what actually went wrong and how you can fix this. Another tips you should take home is the AdSense 6 month old blog policy for getting an approved application, This because it is assumed that 6 month is enough time for a Blogger to improve his blog. Don’t let AdSense rejection weigh you down. Don’t let it kill your motivation for blog. If it is Insufficient content, you need to know that your post must not be less than 300 words. Your content must be rich enough to always draw your readers back. And if its Ownership issues, you can always verify your site ownership with google webmaster and then reapply back. If its copyrighted material (Plagiarism), you’ll need to remove all the post you copied from other blogs and right a new rich post afresh. Most bloggers always miss this, copying a post is not wisdom, it is foolishness. If you want to copy, make sure you rewrite all the post. So remove all copy post and apply again. Your Blog Design: Those of you that must have been rejected several times, you must have seen a message like this “difficult site navigation”, it simply means your design is hard to understand or will give your readers heartache. One of the mistake which I have seen many new blogger do is, they create a new blog with a crappy disgusting design, add few low content posts and then apply for AdSense. Believe you me, even if I’m AdSense, I won’t approve you because first impression last longer. Your site design matters a lot. If you are on wordpress, use a professional wordpress theme to setup your blog and if you are on blogspot, use a blogspot theme which is not only beautiful but also look professional. Build More Traffic: I know traffic is very important in blogging. Without traffic, who will read your post? Don’t allow your traffic to come from only one source but majorly should be from search engine. Do you know you can get more traffic on Facebook… do you know you can advertise on Facebook for $1 and get more traffic to your blog. Do you know you can get more traffic on Nairaland…Don’t just narrow your traffic source to just BBM Channel or Facebook alone, but also work on your SEO before reapplying back for AdSense. Be familiar with all adsense policies to be sure your site complies to it. Reapply for Adsense: if you’ve done the above carefully, you can then re-submit your application for adsense and watch your approval comes in lesser period. Mind you, this is not the only way you can make money with your blog… But Without Adsense, you can also make money on your blog.